Ah yes! I rememeber those. Specially the Power Pad, which had given me hours of fun! But then again, I think the gaming was not ready for motion sensoring, and there was still a long way to go. Ever got to use that little robot that appeared with some NES? A friend of mine had a Rob, but I don’t remember us ever actually playing with it. I do remember the Power Pad working pretty well though, did you use it with any games aside from Stadium Events or Track and Field? Never knew if there were others. I did not own a “console” until the GB and the SNES. I played the track and field a lot with my friends back in the day. 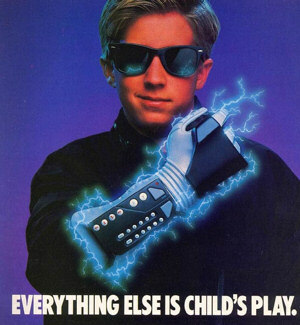 I love the Power Glove- it’s so bad. A friend and I played Gyromite with Rob the Robot when it was new, but we actually ended up interfering with Rob’s movements to peg the levers when we wanted him to. Effectively, Rob was pretty much sitting that one out, but as a 9-year-old, it felt to me like he was very much the opponent we were kicking the crap out of in Gyromite. Just keep your Power Glove offa her, pal! I have a copy of Gyromite I picked up at a Goodwill, but I’ve never played it, just assumed it wouldn’t work without Rob.